Marine habitats and ecosystems along the South-East Coast are healthy and sustainably productive, and treasured for their biodiversity, integrity and special nature. Areas of particular importance for biodiversity and ecosystem services are conserved through effectively and equitably managed, ecologically representative, and well connected systems of protected areas and conservation measures, and integrated into the wider landscapes and seascapes. Wide consultation throughout the South-East coastal region and beyond, including all known interested parties, communities of interest, and the public at large. Compilation of an inventory of the values, uses, and characteristics of the South-East coast, based on scientific, technical, mahika kai, and community input. Recognition of the value of the coastal marine environment, its patterns of change and stability, the threats to it (both marine and terrestrial), and aspirations for it; and maintenance and restoration where possible of the integrity of a natural land-sea continuum. Identification of the full range of habitats and ecosystems as representative examples of both the typical and the special. 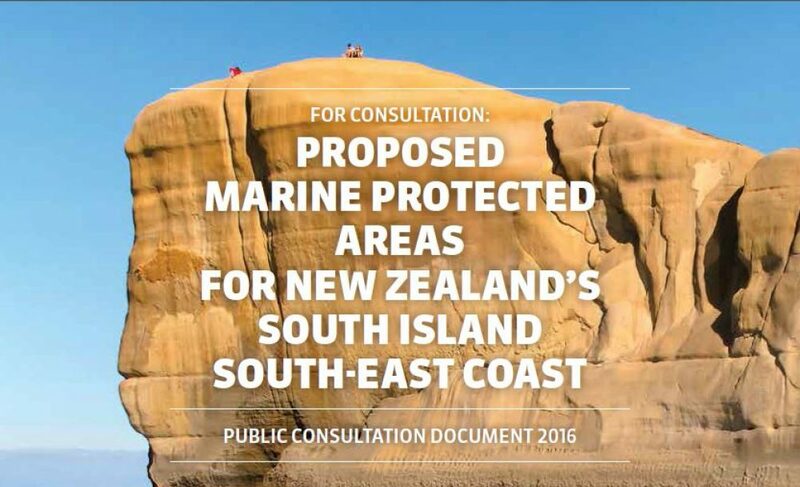 Recommendation to the Ministers of Conservation and Primary Industries for a network of marine protected areas that will maintain and regenerate biodiversity and build resilience consistent with the NZ Biodiversity Strategy and Marine Protected Areas Policy and Implementation plan. Make available forum findings to relevant official bodies, such as regional councils, where appropriate. To give effect to the principles of the Treaty of Waitangi, and the Ngāi Tahu Deed of Settlement. Listen carefully, maintain good humour. Deliver an inclusive, transparent, and accessible public consultation process. Be consistent with the directives of the NZ Biodiversity Strategy and Marine Protected Areas Policy, and Implementation plan. Access best available information and use best practice to guide the design for the network of Marine Protection Areas. Acknowledge the importance of the needs and aspirations of future generations, and provide for their needs. Work collaboratively to achieve consensus in decision-making. Respect the intrinsic value of marine ecosystems.